The Wall Street Journal reports Cuba’s government has agreed to give its doctors working in Brazil a modest pay increase, which may help ease some criticism over a controversial Brazilian government program to expand health care. Over the last year, Brazil has recruited thousands of foreign doctors for its Mais Medicos program designed to send doctors into rural areas or poorer parts of major cities where there is little or no medical service. A vast majority of the doctors come from Cuba, under an agreement coordinated by the Pan-American Health Organization, or PAHO. Brazil says it pays all the foreign doctors in the program a salary of 10,400 reais ($4,430) a month. In the case of the Cubans, the money is paid through PAHO to the Cuban government, which then passes on a much smaller amount to the doctors. Under the new deal Cuban doctors will be paid $1,245 a month, up from $1,000 previously, according to the Brazilian health ministry. Moreover, the Cuban doctors will receive all of that amount in Brazil. Before, the Cuban government deposited $600 into an account in Cuba, according to the health ministry. There are currently 6,650 doctors working under the Mais Medicos program, and the Brazilian government aims to reach 13,000 by April, which it says would help some 45 million people—nearly one quarter of Brazil’s population. Read the whole story here. (Reuters) – Brazil is hoping to sell its upcoming KC-390 military cargo plane to Sweden as part of a $4.5 billion deal to buy 36 Gripen fighter jets made by Swedish company Saab AB. The Brazilian Air Force said on Thursday that offsets in the Saab offer included the intention of the Swedish government to buy KC-390s, adding to signs of interest in the new cargo jet beyond Brazil’s traditional Latin American market. The KC-390 under development by Brazilian planemaker Embraer is meant to be a cheaper, more efficient challenger for Lockheed Martin’s C130J Super Hercules. Embraer’s new jet is set for its first flight by the end of the year and has received early commitments for orders from Brazil, Argentina, Colombia and Chile. In Europe, Portugal and the Czech Republic are also involved in the KC-390 project as industrial partners and eventual clients. So far, 60 of the new cargo jets have been requested. Embraer sees a market for more than 700 planes in the segment worth more than $50 billion over the next 10 years. Read the whole story here. The Wall Street Journal – Brazil’s economy accelerated in the fourth quarter of the year but growth remains fickle as key parts of the economy continue to sputter. The growth suggests Latin America’s largest economy was in better shape than had been expected, after preliminary data from the Central Bank of Brazil had indicated that the economy may have flirted with a recession in the second half of the year. Although the economy continues to underperform, signs of expansion may ease some of the gloominess that have made bankers and economists increasingly negative about the prospects for 2014. “I think this result will halt the downward revisions to forecasts for the Brazilian economy this year by economists,” said Flavio Serrano, an economist at BES Investimento in São Paulo. Investments increased during the quarter, whereas many economists had expected a decline, while industry had been expected to contract further, he said. In annualized terms, the economy grew 2.75% in the fourth quarter, according to Mr. Serrano. Read the whole story here. The Rio Times reports that the Brazilian Federal Reserve has introduced a solution for the temporary entry of goods for the FIFA World Cup in June and the 2016 Olympics. Items entering the country needed for international sporting events such as production equipment and sporting gear will now have a simplified import admission system that will allow companies to forgo import taxes and ultimately save time. Under the new rule, goods will go through a warehouse customs procedure and be admitted only for the duration of the specific events. This system will remain in place for future major exhibitions, fairs, and conferences. In a statement, the Receita Federal (Brazil’s Internal Revenue Service) explained that the change was possible because the government agency considered the locations of the international events as temporary customs precincts. Importation to Brazil is widely considered expensive, partly due to taxes and fees along with the length of time it takes, which on average, currently takes approximately thirteen days to reach customs. 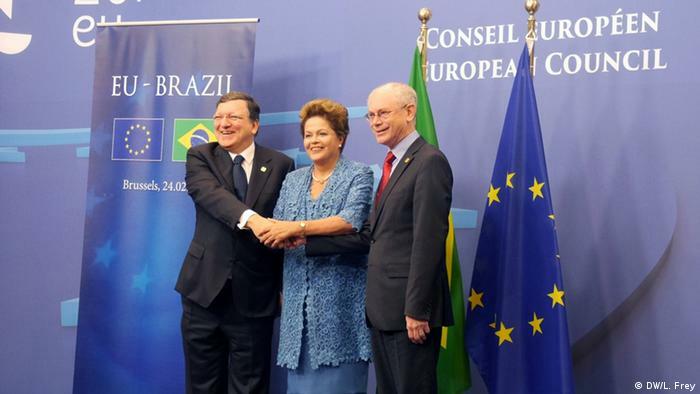 The EU and Brazil first discussed reducing trade barriers in 1999. Although Brazil has been one of the EU’s strategic partners since 2007, little more than a declaration of intent has come about – the discrepancies were too large between Brazil’s import tariffs and European agricultural subsidies. Read the entire story here. Brazilian sugar mills make almost half the world’s sugar exports. The Washington Post reports that sugar millers in Brazil are urging India to end a subsidy program on expectation it will cause them to lose as much as $1 billion this year as prices decline. India, the largest sugar producer after Brazil, is offering to subsidize 4 million metric tons of exports in the next two years and granting interest-free loans to mills to help them pay debt to growers. Sugar, which has plunged 40 percent since early 2011, may drop between 7 percent and 12 percent on average this year because of India’s aid to producers, Leao de Sousa, executive director at Brazilian sugar industry group Unica, said by telephone. Unica is in talks with Brazil’s government to seek to build a case against the subsidies at the World Trade Organization, Sousa said after Unica posted a joint statement with Australian producers urging the end of India’s program. “It’s a very worrisome situation because the sugar industry already faces a delicate moment in Brazil due to low sugar prices,” Sousa said. “We’re working to make the government aware of the extent of the problem.” Read the whole story here. On Thursday, The Wall Street Journal reported that Brazil plans to curb spending in order to regain confidence of the markets, avoid a credit-rating cut and help the central bank fight inflation. The government will freeze 44 billion Brazilian reais (US$17.9 billion) already budgeted for spending this year, Finance Minister Guido Mantega said. The government also plans to use a primary surplus of 99 billion reais to pay down the public debt. The announcement was closely watched by analysts looking for signs of fiscal discipline after two consecutive years in which the government had to resort to accounting maneuvers to meet its targets. Read the whole story here. Bloomberg reports that a surge in online shopping is straining Brazil’s warehouse capacity, spurring the push for wider distribution networks. Companies like Arezzo Industria & Comercio SA, Walmart.com, and B2W Cia Digital are expanding their warehouse capacities. This has caused foreign investors to be interested in the market. Prologis, based in San Francisco, joined Brazil’s Cyrela Commercial Properties SA in building warehouses to lease to Walmart.com and others. Singapore’s Global Logistic Properties is increasing the size of its existing distribution centers by almost 100 percent, and Australia’s Goodman Group is adding four sites in Rio de Janeiro and Sao Paulo. Due to the rising middle class, Brazilians consumers are migrating to the internet as computers reach more households. According to Forrester Research Inc., online revenue is set to grow 20 percent this year to 34.7 billion reais ($15.3 billion).